Your teeth were created to last for a long time. But sometimes, gum disease, decay, and even accidents can cause your teeth to fall out. Millions of American suffer from tooth loss caused by a variety of problems, but at my dental office in Long Grove, we’d like to talk about how you can replace your missing tooth, or teeth, with the strongest and healthiest treatment available – dental implants. For many years, the only tooth replacement options available were dentures or bridges. But as dental technology improved, a new and stronger solution became available. Dental implants are the superior tooth loss treatment not only because they replace your tooth, but also your tooth’s root. This is important for a variety of reasons. By replacing the tooth and the root, you’re able to restore your mouth to full function. Additionally, dental implants are a healthier solution: unlike bridges or dentures, they help to keep your jaw bone intact and offer additional benefits. Improved appearance, speech, and comfort. Dental implants look and feel just like your natural teeth. This means that you don’t need to adjust your speech the way you may have to with a bridge or denture. They also fuse with your bone, so they’re a permanent part of your mouth. This eliminates discomfort that’s sometimes associated with removable dentures. Easier eating. With implants, there’s no restrictions on what you can eat. Occasionally, dentures can slip while you’re eating, making chewing difficult and even allow food particle to get under the appliance which can cause some pain. You won’t have that problem if you choose implants. Better oral health. There’s no soaking or removal necessary with dental implants. You can continue to brush and floss as normal. Also, a dental implant does not require your dentist in Long Grove to touch other teeth, meaning that the strength and integrity of the remaining teeth are unaltered, which can improve overall oral health. So what’s the process for getting dental implants? You’ll begin with a consultation during which your individual goals will be discussed and your treatment plan will be developed. After planning is complete, your titanium implant post is placed into your jaw bone. This is the piece that will replace your missing tooth roots. During the healing process, your bone will fuse with the metal creating a strong base. Once healing is complete, an abutment will be added to the post. Your dental team will then craft a custom crown that matches your other teeth in shape, size, and color. The crown is then attached to the abutment and you’re ready to start showing your smile to the world. 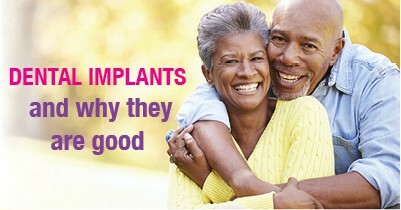 If you think that dental implants may be right for you, give my Long Grove dental office a call. We’ll evaluate your individual situation and discuss all treatment options available to you. We’re focused on providing all of the knowledge you need to make the best decision for your smile. Accepting patients in Long Grove, Buffalo Grove, Lake Zurich, and surrounding areas.